For many, the idea of Robotic Process Automation (RPA) might conjure images of large automated assembly line welders and pickers. 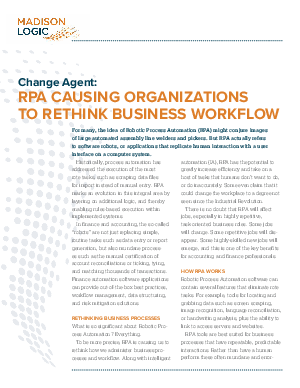 But RPA actually refers to software robots, or applications that replicate human interaction with a user interface on a computer system. In finance and accounting, the so-called “robots” are not just replacing simple, routine tasks such as data entry or report generation, but also mundane processes such as the manual certification of account reconciliations or ticking, tying, and matching thousands of transactions. Download this whitepaper now to learn more!